RecA protein (blue) wrapped around two strands of DNA (orange and pink). An analogue of ATP is shown in bright red. Breakage of DNA is bad news, so cells have powerful methods to fix damaged DNA. One method trims the broken ends and then reconnects them back together. This is fast and easy, but has the disadvantage of possibly incorporating errors during the repair. Cells also have a more accurate method to repair breaks that relies on duplicate copies of the genome. This process is called homologous recombination, and rebuilds the damaged areas using an intact copy as a template. The bacterial RecA protein, and our similar Rad51 protein, perform the tricky task of pairing up a broken strand with its backup copy. The broken strand is first processed by other proteins (described below) to expose a single strand. RecA and Rad51 surround this single strand, and then capture the backup DNA copy, matching the sequence of the broken strand with a homologous sequence in the intact DNA double helix. 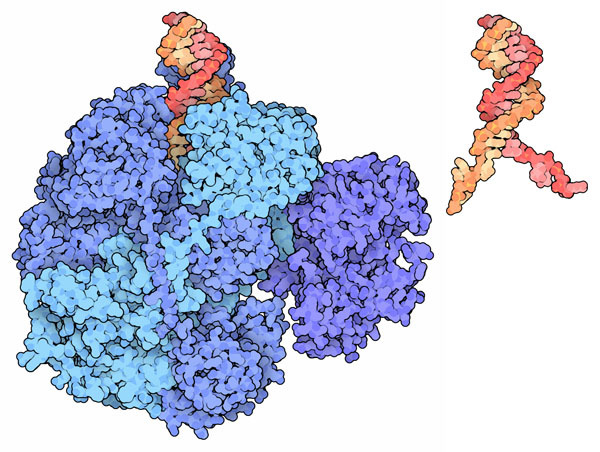 Inside the RecA complex, the single strand is then exchanged for one of the strands in the duplex DNA, powered by ATP. Finally, a host of other proteins fill in all the missing sections of DNA, ultimately restoring two matching copies. Researchers have solved structures of RecA and Rad51 capturing different steps in the process of homologous recombination. The structure shown here, from PDB entry 3cmx , shows RecA surrounding the heteroduplex, after the damaged strand has been paired with the intact copy. The structure was determined used an engineered form of recA, with five copies of the protein tethered together. The illustration was created by overlapping several copies of this five-subunit structure to create a model of the long helical complex. The structure revealed that the DNA is stretched when it binds to recA, with a distinctive pattern of three bases to each protein subunit. RecBCD complex (blue) unwinding DNA (orange and red) and preparing it for recombination. A large complex of three proteins prepares the damaged DNA for the strand exchange by RecA. This complex includes subunits that clip away one strand of the damaged DNA, to create the necessary single strand. Another subunit monitors the process and stops the cleavage when a particular sequence of nucleotides is found, triggering the complex to start assembling RecA for the recombination. The structure shown here (PDB entry 1w36 ) includes all three subunits along with a short piece of DNA. The structure revealed that the complex unwinds the blunt end of the damaged DNA, making the strands available for processing. Mutations in the process of homologous recombination have dangerous effects on the health of the cell. For instance, the huge protein BRCA2, shown here in green (PDB entries 1miu and 1n0w ), was discovered through its connection to breast cancer. BRCA2 binds to DNA and also has eight binding sites for Rad51, and it assists with the assembly of the filament around damaged DNA. PDB entry 1n0w includes a Rad51 subunit bound to one of these BRCA2 binding sequences. To take a closer look at this structure and compare it to other Rad51 structures (PDB entries 1pzn and 1szp ), click on the image for an interactive Jmol. Structures for Rad51 and several related molecules are available in the PDB. You can start with the structure of Rad51 filament in PDB entry 1szp, and then use the "Sequence Similarity" tab to find related proteins. You can explore structures of RecA bound to a single-stranded DNA in PDB entries 3cmw and 3cmu. D. B. Wigley (2013) Bacterial DNA repair: recent insights into the mechanism of RecBCD, AddAB and AdnAB. Nature Reviews Microbiology 11, 9-13. W. K. Holloman (2011) Unraveling the mechanism of BRCA2 in homologous recombination. Nature Structural and Molecular Biology 18, 748-754. 3cmx: Z. Chen, H. Yang & N. P. Pavletich (2008) Mechanism of homologous recombination from the RecA-ssDNA/dsDNA structures. Nature 453, 489-494. 1szp: A. B. Conway, T. W. Lynch, Y. Zhang, G. S. Fortin, C. W. Fung, L. S. Symington & P. A. Rice (2004) Crystal structure of a Rad51 filament. Nature Structural and Molecular Biology 11, 791-796. 1w36: M. R. Singleton, M. S. Dillingham, M. Gaudier, S. C. Kowalczykowski & D. B. Wigley (2004) Crystal structure of RecBCD enzyme reveals a machine for processing DNA breaks. Nature 432, 187-193. 1pzn: D. S. Shin, L. Pellegrini, D. S. Daniels, B. Yelent, L. Craig, D. Bates, D. S. Yu, M. K., Shivji, C. Hitomi, A. S. Arvai, N. Volkmann, H. Tsuruta, T. L. Blundell, A. R. Venkitaraman & J. A. Tainer (2003) Full-length archaeal Rad51 structure and mutants: mechanisms for RAD51 assembly and control by BRCA2. EMBO Journal 22, 4566- 4576. 1n0w: L. Pellegrini, D. S. Yu, T. Lo, S. Anand, M. Lee, T. L. Blundell & A. R. Venkitaraman (2002) Insights into DNA recombination from the structure of a RAD51- BRCA2 complex. Nature 420, 287-293. 1miu: H. Yang, P. D. Jeffrey, J. Miller, E. Kinnucan, Y. Sun, N. H. Thoma, N. Zheng, P. L. Chen, W. H. Lee & N. P. Pavletich (2002) BRCA2 function in DNA binding and recombination from a BRCA2-DSS1-ssDNA structure. Science 297, 1837-1848.